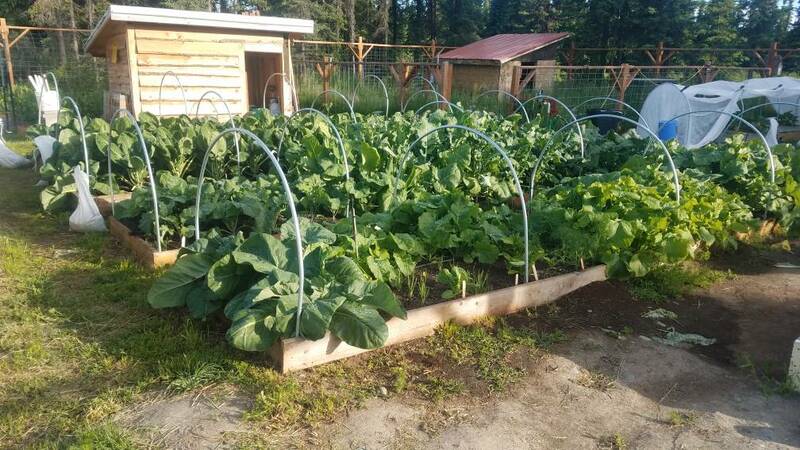 Thread: 2019 Kenai Peninsula garden reports? Mine is doing good except for the Slug damage on my cabbages. My Emiko hybrids got hit hard and they were growing nicely. But my other cabbages are looking better. Decided some commercial slug killer was in order and it helped a lot. Going to start using it earlier next year. Harvested some with more on the way. Sharing with my parents was nice. Got some Zucchini doing well. Onions aren't big but they're tasty. My carrots didn't get thinned properly so they're small. 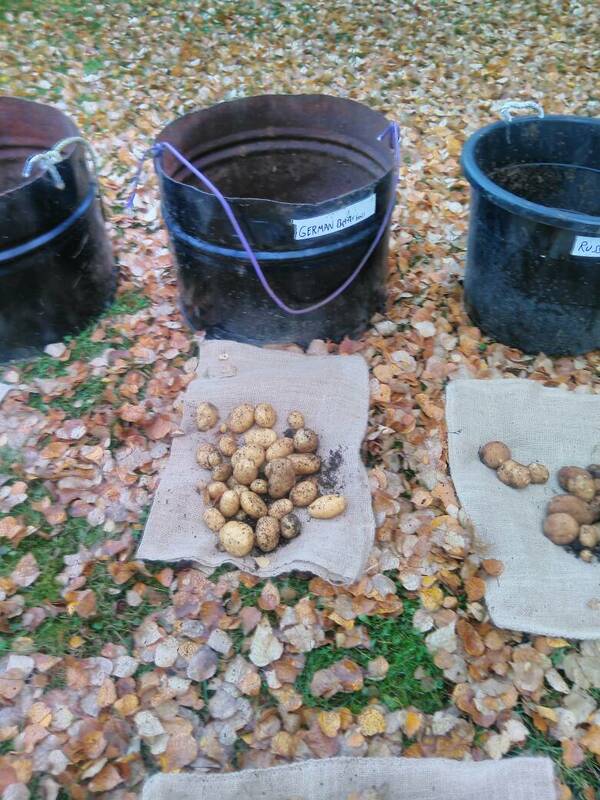 Potatoes plants look great in my 1/2 drums. This is my second year on a full size garden. 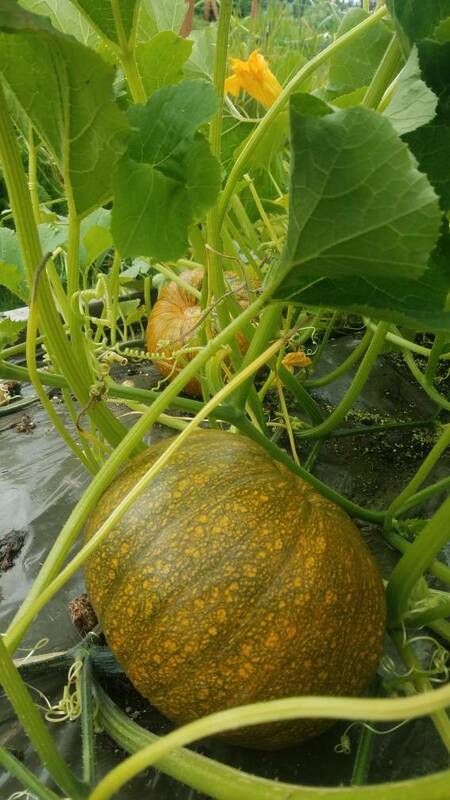 How have your Peninsula gardens faired this year? I harvested some more zucchini some carrots and some cabbages. 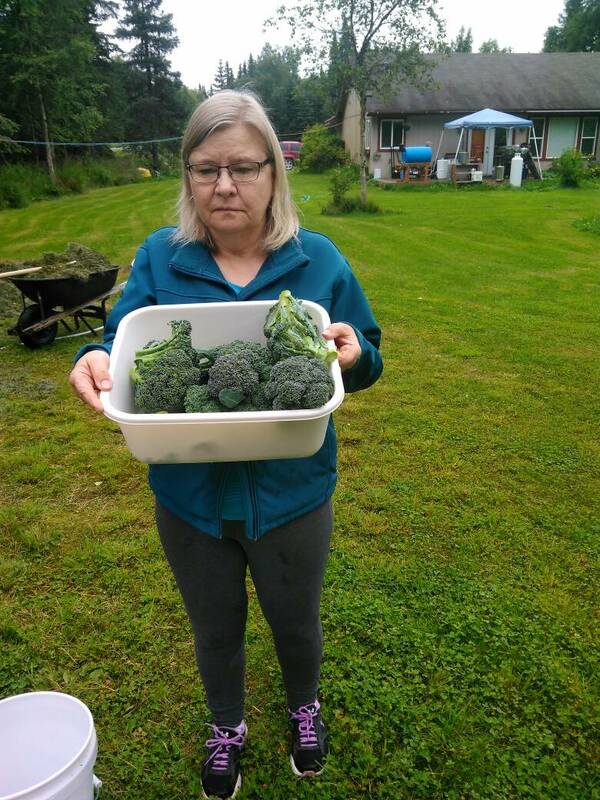 My mom has been been harvesting more broccoli and some zucchini as well from my garden while I was at work. Maybe an electric fence will help keep her out. I have 5 strands of electrified ribbon wire to keep the moose out. But my parents can have as much as they want. I owe them so much for their help and support over the years that the least I can do is give them some garden veggies and some of my fresh chicken eggs. Respect and help your elders. Guess that's how I was raised. Besides there's only one of me and I just can't eat it all. Of course! I sure hope you knew I was joking. But so far the momma moose hasn't eaten any veggies since I put the electrified ribbon wire up. beautiful broccoli... What I plant always starts to bolt when the main head is about half that size, but then we usually get lots of side shoots for the table. Mine did pretty well this year. These frosty nights that we've been having are shutting a few things down though. Brussels are still doing well as are the last couple heads of cabbage. I think next year I'm going to plant two rounds of broccoli as I have the same problem as above in that the heads start to bolt before they form fully in July. 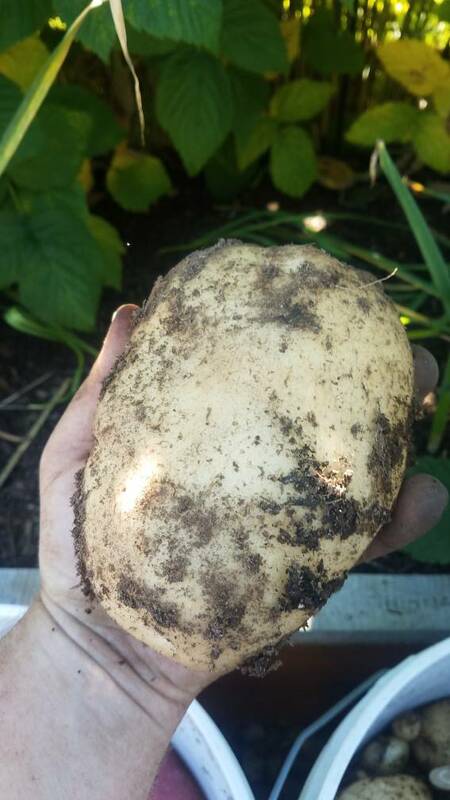 Already dug the taters, hit my 100lb goal this year at 106. Turnips and rutabagas got hammered by the root maggots as usual. 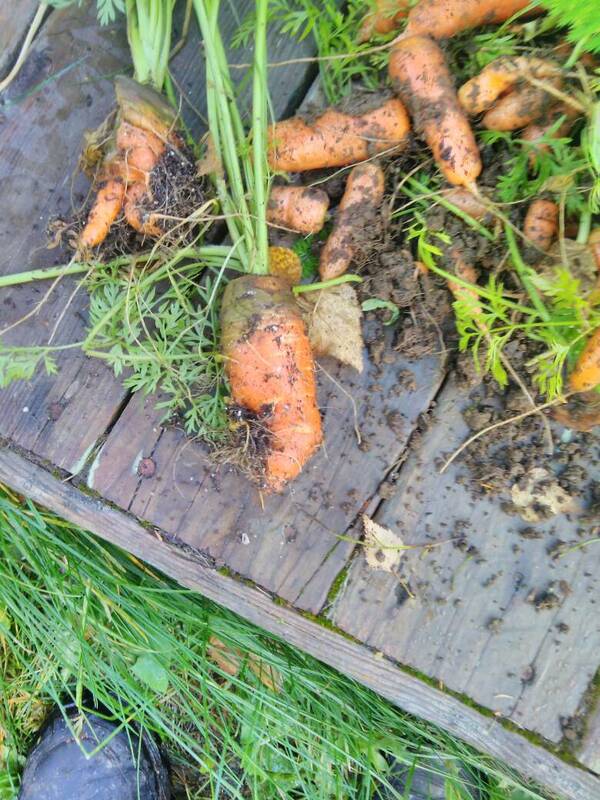 Carrots are still going. On the slugs, the best remedy I've found is ammonia. 1 part to 3 parts water fries them nicely and doesn't seem to hurt the plants, at least the brassicas, at all. Any stronger of a solution and I've had it burn the leaves. Wow, impressive setup!! You've inspired me to up my game next year. As far as slugs, the only thing they hit hard was my broccoli leaves. I ended up putting small stacks ( 3 pieces per stack) of split firewood dispersed through my garden. That created a dry spot for the predacious beetles to live that love to eat slugs. This greatly reduced slug numbers. That is the first I've heard of the firewood stack. I will definitely be trying that next year. I didn't have too much trouble with them this year myself, just a bit on a few cabbage. Last year was horrible though with all the rain. I do get a sick pleasure from frying them with the ammonia though. It is also good for the soil. The firewood is definitely getting added to my repertoire though. My potatoes are still growing for now. And a few cabbages and my onions. Still a little broccoli but just those side shoots. I have 3 or 4 zucchini still to harvest and some carrots. Moose hunting at the cabin got in the way of gardening. I didn't weigh them but I probably have 30# or so of potatoes. I planted them in tubs and half drums plus one big box with a dirt mound on top. The box was used because I bought too many seed potatoes so I just randomly placed all my extra seeds potatoes in some dirt in the shallow box from my new barbecue. I tried Yukon golds, Cal White's, Gold Rush russet, and German butterballs. they all produced about the same so taste-testing this winter will determine what varities I plant next year. My cabbages did well and I had the most delicious cabbage soup on Saturday. Those OS cross just barely fit in a 5 gallon bucket. For reference that glove is a size large. The Copenhagen Market early seem to do well also. I didn't thin my carrots enough but they turned out OK. Onions taste great but did not get as big as I was hoping or as they should have been for the variety. Turned my chickens lose in what's left of my garden. They like it and I really think they're doing good things for the garden. I finally getaway from the root maggots in my onions, but I too have problems thinning carrots enough. I thinned mine twice and they still needed more. but I got a lot of little ones for the freezer anyway. Definitely some nice looking cabbage. I'm ashamed how I let the slugs and snails ruin mine. I had some amazing Emiko hybrid cabbages that I started from seed and grew in my indoor little upright Greenhouse thing then moved to the garden. But the Slugs turned them into Swiss cheese. Went to the slope and they were looking good 2 weeks later nothing but slug holes all through them. I ended up feeding them to my chickens I didn't even eat them myself. Fortunately my other cabbages didn't get attacked so badly. I was trying to do the old organic thing but I finally just said screw it and went to the store and bought some commercial slug killer. Next year I'm going to use the commercial slug killer from the get-go. Being my garden is raised bed I think I can apply it around the entire garden rather than actually putting it in the garden. At least I'm hoping that works! It's always fun to feed the Slugs to the chickens and watch them eat the crap out of them things. I've often thought about chickens, but the Officer in charge of laundry and morale says thats a definite NO. I've often thought about chickens, but the Officer in charge of laundry and morale says thats a definite NO. [/QUOTE]That's too bad it's such a fun and easy animal to have. I love the fresh eggs everyday and the compost they provide me from their waste is just amazing for my garden. The only real negative to keeping chickens is the initial cost of the coop and run. Other than that they don't cost a fortune to feed and house and they provide all the fresh eggs I can eat and a bunch for gifting. You don't need a rooster for eggs so the noise is minimal. I have just over an acre of property so I have them far enough from the house such that they don't bother me at all really. I have gotten a few Roosters by accident when I've ordered hens through my local feed store (they only guaranteed 90% success rate on sexing). But those just get butchered and eaten. My only real regret with the chickens is that I didn't get them much sooner like right after I bought this house. The chickens and the garden really seem to complement each other. The chickens eat most of my table scraps and all of my vegetable type of scraps. Outer cabbage leaves and all that kind of stuff. I think last I figured it out they cost me about 50 to $60 a month. And I get about three dozen or more eggs every week. Oh I recognize the benefits of having chickens. The fertilizer, their eagerness to eat all the slugs they can catch, the fresh eggs, and an occasional sunday fried chicken dinner. But I also realize someone should tend them every day, someone has to scoop out the chicken house, etc, etc. I retired from farming at the age of 17. Having been around and caring for a myriad of animals big and small, farm and otherwise, I would say chickens rate as one of the easiest to care for. Way easier than a dog by far. The only thing I do on a daily basis is collect the delicious eggs and I could realistically do that every few days if I wanted. I fill feeders and waterers every 3-4 days as needed. Coop cleaning is once every two weeks and in the summertime it can easily go 3+ weeks when they're outside all the time. Feeders and waterers takes 10 minutes tops. Coop cleaning takes me 15 minutes or so and all coop waste goes into the compost pile 10' away from the coop door. Once a year I add wood chips to the run which takes half a day or so as I chip my own with a borrowed wood chipper from alder brush I am removing anyway. Cost wise they cost me roughly $60 per month. Buy that is mostly offset by the eggs I get. I intend to always keep chickens. As long as possible anyways. They are much easier than most people realize.